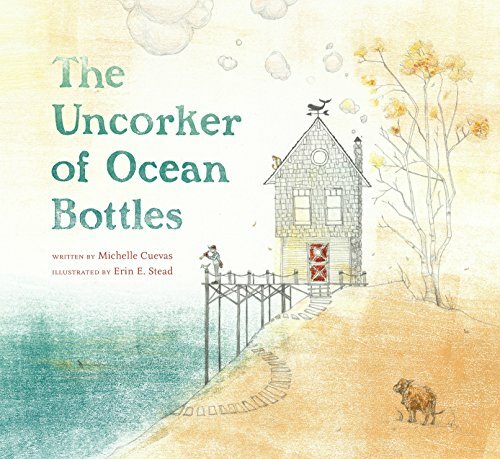 The Uncorker of Ocean Bottles, written by Michelle Cuevas with illustrations by Erin Stead, is unique in its story and powerfully engaging. Michelle Cuevas is a talented and creative author with an abundance of originality in her stories. With such interesting titles to her credit including Beyond the Laughing Sky and The Masterwork of a Painting Elephant she is already a breath of fresh air in the young readers market. Now she has done a beautiful and elegant piece of storytelling for a younger market in delivering her first picture book. As a Caldecott Medal illustrator, Erin Stead does not disappoint. Her light touch and depth of characterization meld seamlessly in The Uncorker of Ocean Bottles, adding another winner to her stunning collection. Stead has the ability to take hold of characters and communicate something personal about them and their journey, their thoughts, their dreams. The Uncorker is no exception. The Uncorker goes about his work with simple determination. He will go to great lengths to deliver each message he finds. Near or far, fair sky or stormy weather, happy messages or dreary ones, nothing will stop him from connecting message with recipient. All the while, he himself is aching with a dream. Thinking himself unworthy friendship material for he “stank of seaweed, salt and fishermen’s feet,” he nevertheless longs for a friend, for his own bottle to come in, for a deeper connection within his lonely world. And so it happens one day. He uncorks a bottle with an invitation to a party, with no name attached. According to his characteristic simple determination he goes about trying to find a recipient, stopping only from sheer exhaustion. When no one surfaces to claim ownership, he decides to deliver the massage directly to the party. Imagine his surprise when he is welcomed as the guest of honor to the beach side gala. In this sweet and gently story, The Uncorker of Ocean Bottle leaves the reader powerfully transported to a different world, a world where friends are found where one least expects them, where people live a simple existence, where cathartic release comes easily. For an adult it conjures a feeling of being grounded in the world of a child. Not a bad thing at all.